Regrouping several ethnic groups and languages, the culture of Laos is unified around the Lao Loum majority and the Buddhist religion. However, throughout centuries Laos has also gathered influences from neighboring countries Thailand, Cambodia, Myanmar, Vietnam and China, and France, the former colonial power. Within more than 1000 historical and natural sites in the world, the United Nations Educational, Scientific and Cultural Organization – UNESCO – has recognized the importance of Laos through the classification of two sites for their unique cultural, historical and architectural value for mankind. Here is the complete list of World Heritage Sites in Laos together with details and beautiful pictures to keep in mind for the use of travel and tourism professionals, and the viewing pleasure of all. 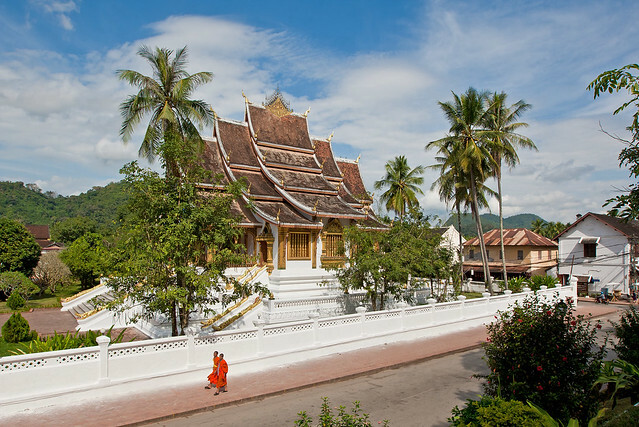 The ancient capital of the old Kingdom of Laos, Luang Prabang is a town that gathers traditional Lao architecture and French colonial buildings from the 19th and 20th century in a remarkably well-preserved blend of European and Asian cultures. The Champasak Cultural Landscape was built between the 5th and 15th century under the rule of the Khmer Empire. Various structures are organized in a geometric pattern that embodies the Hindu vision and relationship between man and nature, including two cities, the Vat Phou temple complex and other temples, shrines and waterworks. Here is the full list of the UNESCO World Heritage Sites in Laos. For more information about them, visit the Laos page on the website of the United Nations Educational, Scientific and Cultural Organization – UNESCO. What do you think of these World Heritage Sites in Laos? Which do you prefer? Do you have some tips to make a better visit? Any other site in Laos you think should be added by UNESCO? Leave your comments below!